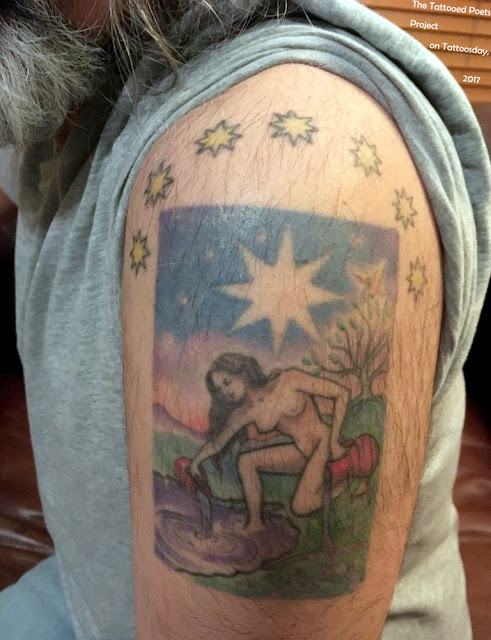 "I’ve been reading Tarot cards for so long, almost 30 years, that I had a tough time deciding what to choose for this tattoo: the cards that are most important to me change over time, as I grow and my psyche and external circumstances change. But The Star has always been a constant. It’s a card that represents artists and artistry—often a card that signifies writing and music. It’s also a vital dream card. If The Star shows up in a tarot spread, this suggests that the querent’s dream-life is likely central to the reading. In this way, the card is a key pathway to the unconscious for me. The woman in the card pours water on the ground from a jug in her left hand; this water flows into the pond where the woman also pours water from a different jug in her right hand. Her left leg is touching the ground, bent at the knee, while her right foot is in the water. What is on the surface—literally what 'grounds' us—is inextricable from the below-ground flow. It’s how I would like to live, with my conscious and unconscious minds in constant, interconnected conversation with each other." He credited The Star to Esther Garcia (@butterstinker) of Chicago’s Butterfat Studios (@butterfatstudios). "This was my first tattoo—a simple, iconic image from my childhood, back when 45rpm records were made with holes in their center that were too big for the record to be played on a standard turntable. You needed to buy a cheap, yellow plastic adaptor that would snap into place in the center of the record. The adaptor featured a smaller hole in its center, and this hole fit perfectly into the spindle at the center of a turntable. I didn’t realize that the 45 adaptors were virtually obsolete until I got the tattoo. It became a generational marker. 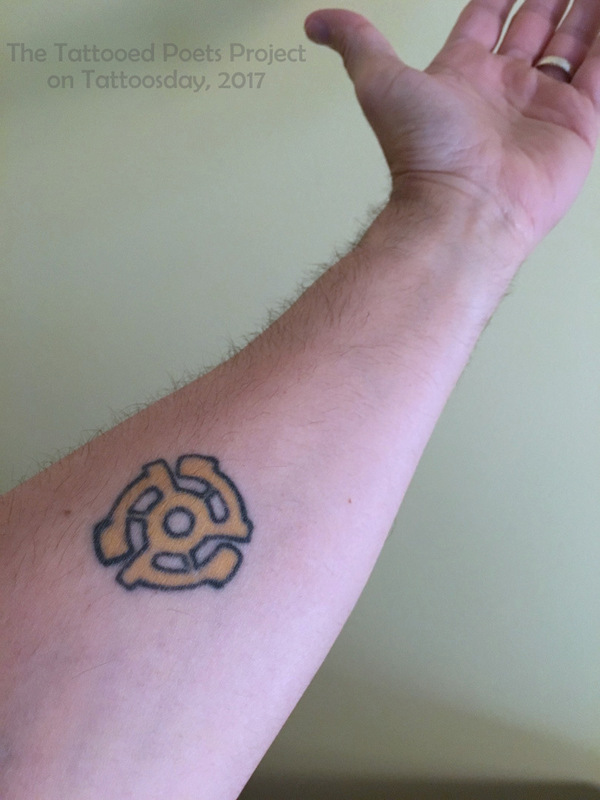 The only folks under 25 who could identify the tattoo were record collectors and audiophiles. One of my students once asked me after class, 'What’s your tattoo? Is it a religious symbol?' As a musician, and as someone who can’t really be happy without being surrounded by music, I said, 'Depends on how you define religion'... The tattoo was created at a shop in Oakland, California, many years ago." over the workers as he raids the honey. It’s what comic books call weird science. and red liquid, then something insensate. pollen from asphalt outside his laboratory cabin. The dust yellow, tinged with pink sunrise. Tony Trigilio’s most recent collection of poetry is Inside the Walls of My Own House: The Complete Dark Shadows (of My Childhood), Book 2 (BlazeVOX [books], 2016). He is the editor of Dispatches from the Body Politic: Interviews with Jan Beatty, Meg Day, and Douglas Kearney (Essay Press, 2016) and Elise Cowen: Poems and Fragments (Ahsahta, 2014). He teaches poetry at Columbia College Chicago, where he is Interim Chair of the Creative Writing Department. His website is http://www.starve.org. Thanks to Tony for sharing his poem and tattoos with us here on The Tattooed Poets Project! This entry is ©2017 Tattoosday. The poem and tattoos are reprinted with the poet's permission.